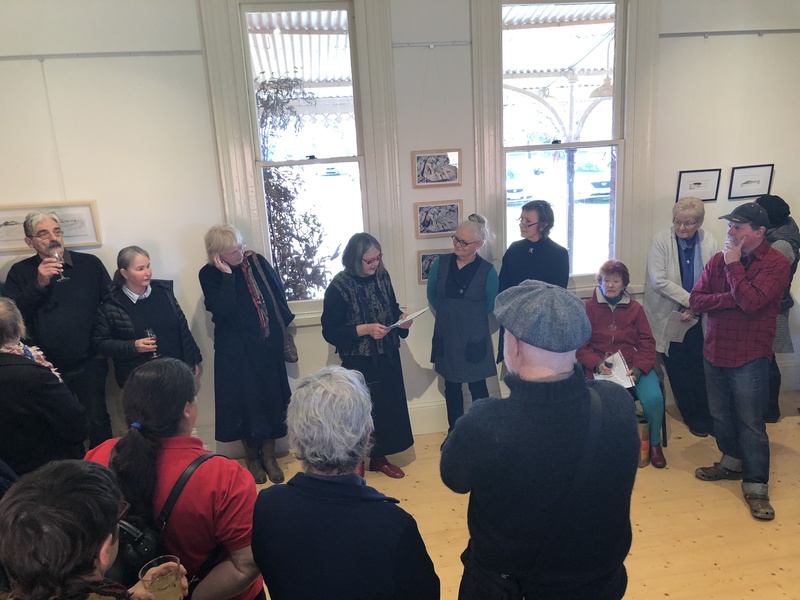 ‘Earthbody’ was beautifully launched last Sunday at the Arts Hub with a large and appreciative crowd in attendance. Here is a lovely note from Ros Hart about her response to the event and the works. Congratulations on a wonderful, wonder-filled art exhibition and a very enjoyable launch yesterday. I think this my favourite of all art exhibitions I have been to at the Arts Hub. I loved Belinda Prest’s work especially (wish I had $$$ to spare). Her work took me right back to my younger self when I was a jillaroo, out all day in the highlands of Victoria, looking across beautiful vistas which mending fences and attending to livestock. My favourite of your lyrical pieces, (Saide), is the weaving in the second room. I loved the flow of the white through the burnt oranges and browns, underscoring the delicate and minimalist placed pieces pf your beloved found vegetation. Ann Berg’s room was stunning too – reminded me of aboriginal dreaming. I could feel Ann’s heart in her work. Warm and powerful. …. I loved the floaty ethereal, otherworldliness, dreamy quality of Chrisanne Blennerhassett’s work. It was full of heart. Please pass onto your fellow artists my thanks and gratitude for the hard and heartfelt work you all do to bring insight, reflection and beauty into our world. Thank you from Ros. Note: This Exhibition, EarthBody, is open all weekends in August from 11am – 5pm. Viewers and visitors are most welcome. 0419 543 667 text is fine.